Christians’ Favourite Delusions 12: Jesus is the reason for the season. Every year about now, Christians start complaining that Christ has been taken out of Christmas, that we’ve lost the true meaning of the holiday, that the reason we have it at all is because of the arrival on Earth of the Baby Jesus. The tabloid press invariably joins in with this clamour, relating – and often making up – stories of councils that omit the word ‘Christmas’ from town centre displays for fear of offending Muslims. In the States, an influential Christian group has taken to drawing up a ‘Naughty and Nice’ list; stores and organisations that wish customers a ‘happy Christmas’ are to be considered ‘nice’, whether they are or not, while those that opt for ‘happy holidays’ are very, very naughty. Predictably, these Christians advocate boycotting the naughty stores. The mid-winter celebration now known as Christmas pre-dates Christianity by hundreds of years. It originally had nothing to do with Jesus but instead was a way of celebrating the winter solstice at the time of the shortest day (21st December in the northern hemisphere) and the return, in spring, of the sun. It was entirely pagan and many of the customs today associated with Christmas – giving and receiving presents, decorating the house, singing carols and feasting – originate from it. 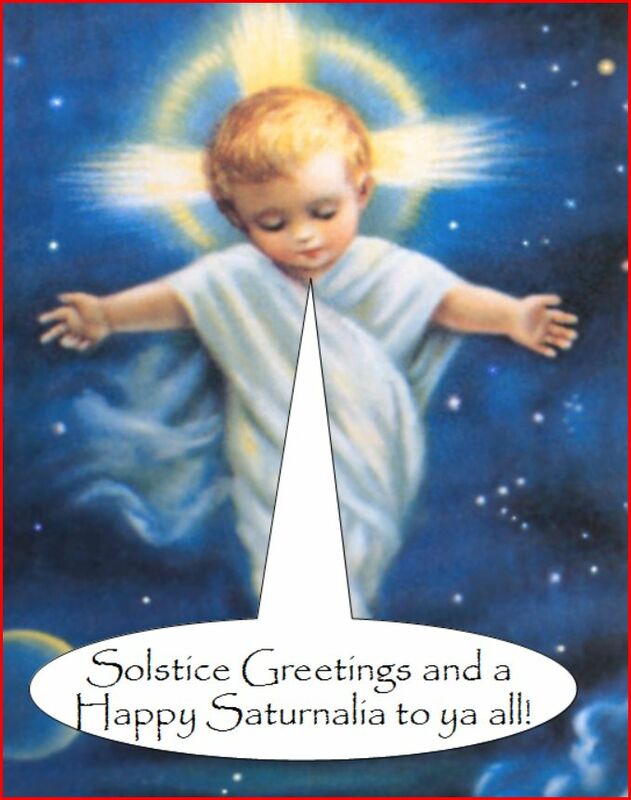 In Ancient Rome, where it was known as Saturnalia, the festival was held on 25th December and marked the birth, not of Jesus but of the unconquerable sun (Sol Invictus). The early church usurped the festival in the fourth century; too popular to eliminate, they superimposed their saviour and his mythology on to it, in an attempt to make it their own. This had the added bonus of demonstrating – a bit late in the day – that Jesus really was born as a human, when there were those around who claimed otherwise. So Jesus is not the reason for the season; a pagan celebration of the winter solstice is really what it’s all about. This entry was posted in Christianity's failure to deliver, The impossibility of faith and tagged Christmas, Jesus, naughty and nice, pagan celebrations by Neil. Bookmark the permalink.